We had cole slaw with our dinner last night and I thought I’d share the recipe! In small bowl, add salt, garlic pepper, sugar, lemon juice, vinegar and mayonnaise. Whisk together well. 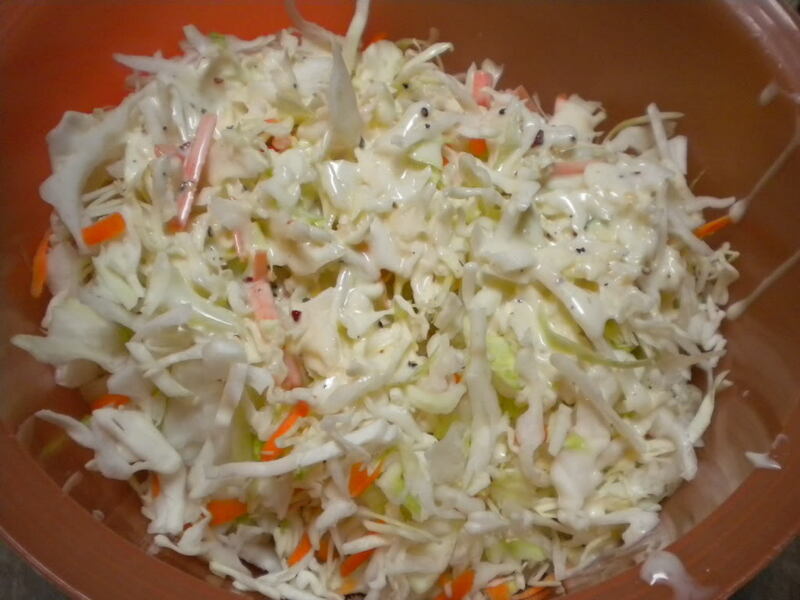 In larger bowl, add cole slaw mix and pour dressing over cole slaw. Mix well. Serve as side with dinner. if you substitute ranch salad dressing for the mayo it gives it a nice kick of flavor. that’s how I make mine! i LOVE homemade cole slaw!!! How awesome! Now I can make easy cole slaw without buying that expensive cole slaw dressing. THANK YOU ERIN! As you may know, I’m not very good at creating my ‘own’ dishes, ESPECIALLY Coleslaw. . .so I am looking forward to using this recipe tomorrow! Cheers! Thank you, thank you, thank you! I made homemade cole slaw a week ago and it failed miserably. Needless to say, the recipe I used was tossed out the window (figuratively speaking). I’ve been searching for a good cole slaw recipe but wanted one that someone else could recommend as a “no fail” recipe. So again thank you! Another idea is Miracle whip (or a generic), a little sugar, a little pepper, a little milk, mixed & poured over the cole slaw mix. It’s my mother-in-law’s recipe, and my kids love it! (And no, we don’t measure, we just eyeball what looks good!). I do believe I’ll try your recipe next time we have it though, sounds yummy! Another money saver: When I finish a jar of mayonnaise, I pour in a little vinegar, a little sugar and some celery seed and shake well…salt, pepper, garlic pwdr, to taste. Store in fridge until you’re having coleslaw and use that for the dressing!! Gets the very last bit of mayonnaise out of the jar (now that Helmanns is sooo expensive) I also grate some onion into the coleslaw when I make it. This is the best cole slaw recipe I have found! I made it last night with our fish dinner and it was great. As our family says….”This is a keeper!” Which means it goes into the family cookbook as a regular! I have always bought the pre-made Kraft slaw mix, but NEVER AGAIN! Thanks! Made this for dinner tonight and just “taste tested” it. It’s so yummy. I went to buy coleslaw dressing this past week and was startled at both the price and the ingredients listed that I couldn’t pronounce. I thought, there has to be a way to make it myself. Sure enough, I found your fantastic recipe. Thanks for saving the day! Thank you for sharing this. It was so good. Great recipe! I found it much easier to make in a rubbermaid/tupperware container and then shake it vigourously, rather than stirring it in a bowl. 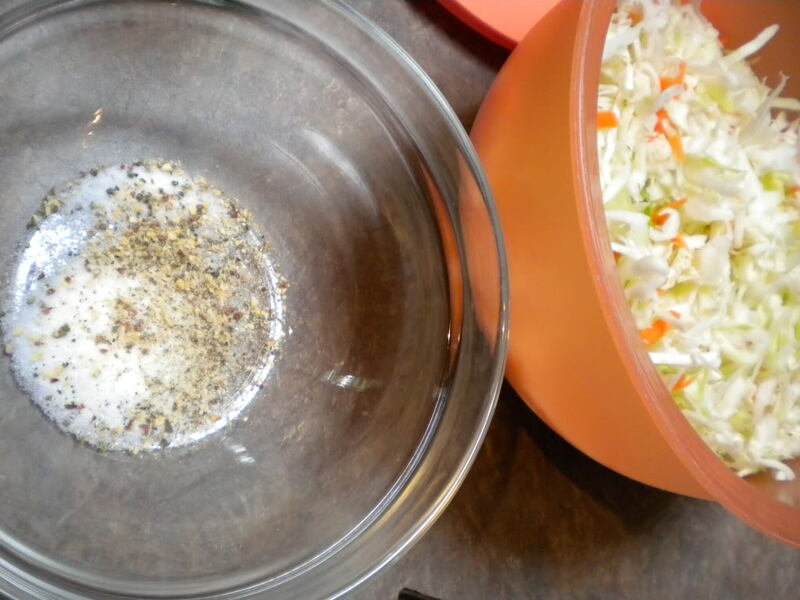 Makes it easier and faster, while more evenly distributing the dressing on the cole slaw. I do not like mayo. Therefore, I use ranch dressing and a teaspoon of mustard. Everyone loves it. Half cup mayo + two ounces cider vinegar + 1 tbsp sugar = dairy free lighter version for a 14 ounce bag of slaw.